The markets have been difficult terrain for investors and advisers alike over recent years. Those trading single asset classes have had mixed results and the idea of diversifying is becoming ever more appealing. Academic research and fundamental evidence both show that it’s this strategic asset allocation of a portfolio, not market timing, that will determine the vast majority of the portfolio’s return and risk. Achieving the right balance between asset classes, however, is a timely process which relies on complex data, expertise and resources. > WHAT ARE MULTI ASSET PORTFOLIOS (MAPs)? 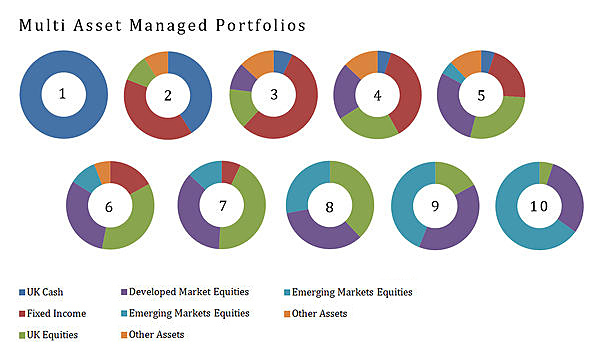 Multi Asset Portfolios provide a low cost, broadly diversified solution that will adapt to all cycles of the economy. As the markets change, models are rebalanced, increasing exposure to assets that are performing well and reducing exposure to those that are weaker. > IS A MULTI ASSET PORTFOLIO FOR ME? Through our Multi Asset Portfolio solution we are able to give you the choice of one of 10 risk graded models, giving you the ability to choose the precise option that best suits your objectives. Your attitude to risk will be determined by industry leading risk profiling systems. I’ve dealt with Antony and Matthew for a number of years and have to say the service has been brilliant. They manage all my family’s money and we highly recommend them. Our investments and pensions have done very well and whenever I have any questions they always go out of their way to help!